Boxwoods Go Snap, Crackle, and Pop! I've already posted a BYGL Alert on Boxwood Leafminer (Monarthropalpus flavus) this season that described its life-cycle, detection, and management [see "Browned Boxwoods," April 13, and More Information below]. However, I only briefly described one of the most notable side effects associated with this non-native midge fly: odd rustling or popping sounds radiating from heavily infested boxwoods. We first reported on this strange phenomenon in a BYGL report in 2003. I had a gardener ask me if I had ever heard odd sounds coming from boxwoods; she described the noises as sounding like "something munching Rice Krispies." Her boxwoods were heavily infested with boxwood leafminer. At the time, Dave Shetlar (OSU Entomology) also noted he had received reports of rustling sounds coming from infested boxwoods. Last week, Curtis Young (OSU Extension, Van Wert County) sent me this e-mail message: "my MG coordinator came in yesterday describing her boxwood as crackling." His message was accompanied by some great pictures showing bright yellow leafminer larvae (maggots) inside the leafmines. Yesterday, I experienced noisy boxwoods for the first time and I must say, the sounds were a bit creepy. I was checking on leafminer development in some heavily infested boxwoods in a local park when I started hearing "snap, crackle, pop." I thought it could be the wind at first, but the sounds continued long after the wind settled; the leaves and branches were not moving. I also checked for animal activity such as birds, voles, or snakes. Nothing. To my knowledge, no one has ever fully investigated the cause behind babbling boxwoods. In my April 13 BYGL Alert, I repeated one hypothesis that the sounds are made by the midge fly pupae wiggling around in the leafmines, or breaking through the tiny window-like spots on the undersides of leaves produced by the larvae to aid adult emergence. Indeed, you will see pupal skins hanging from leaves when the adults appear. However, this doesn't explain Curtis' report that noises were coming from boxwoods with maggots and no pupae. Another suggestion is that the sounds arise from the upper and lower leaf surfaces separating and drying out in heavily mined leaves. I believe this explanation has some credibility based on what I observed yesterday. The maggots spend the winter as 3rd instar larvae inside the leafmines. They resume feeding in the spring and molt to a 4th instar stage. These large larvae produce a lot of damage quickly with multiple maggots per leafmine. It would be easy to imagine noises arising from the leaves as the delaminated epidermal layers flex as they dry out. The sound may even be amplified by the dried tissue functioning like the head of a banjo. Whatever the cause, the bottom line is that reports from gardeners or landscapers that they've heard boxwoods going snap, crackle, and pop should be taken seriously. 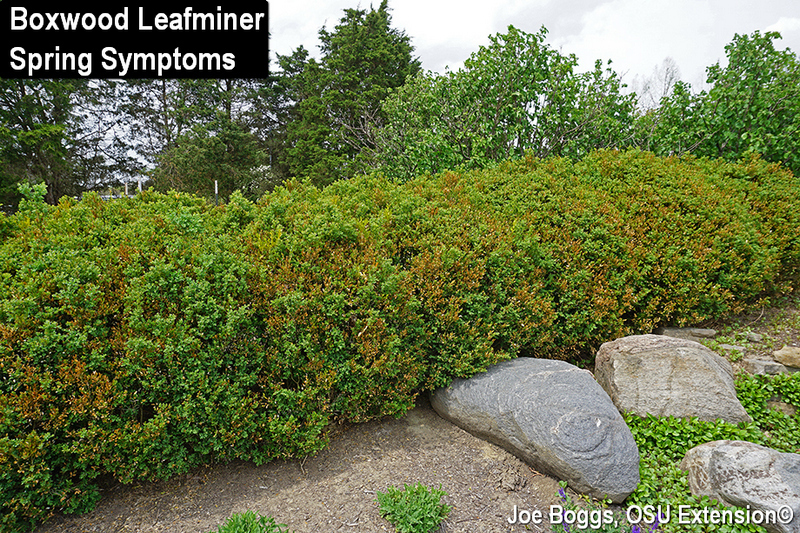 The odd sounds are an indicator of a heavy boxwood leafminer infestation.